Are you thinking like a challenger brand? Naming – evolution or revolution? In case you’ve been under a rock for the past week, this new ad urged men to do better by turning the original Gillette strapline “The best a man can get” on its head, with the new and thought-provoking “The best men can be”. Sparking a debate about the next generation of masculinity in light of the #MeToo scandals should of course be lauded. However, the ad caused a flood of mixed responses, including a large number who viewed the film as sexist and anti-male. In some of the analysis, almost 40% of women reacted negatively to it. Across the team here in the studio even, there was a range of reactions to the ad. What was universal though, was our admiration for the position they’re taking in starting the conversation. Gillette are absolutely on the right side of this important argument. Although Gillette themselves say they are happy with sales in the aftermath of the controversy, it’s really too early to tell what type of impact this is all going to have on their reputation, market-share and brand value. However, two examples from recent history suggest this may well turn out to be a smart move: Patagonia and Nike. Although much less controversial, it’s interesting to look at outerwear company Patagonia, who drew almost universal praise for their response to the savings the company made from the 2017 federal tax cuts last year. When CEO Rose Marcario announced on LinkedIn that “Instead of putting the money back into our business, we’re responding by putting $10 million back into the planet. Our home planet needs it more than we do” – the market gave Patagonia a gigantic thumbs up. Given the mounting evidence to suggest that Patagonia’s revenue grows every time it amplifies its social mission, it’s safe to assume this latest commitment to environmental activism will continue that growth trend. Similarly, when Nike launched its Colin Kaepernick-fronted campaign in the US last autumn, it created a huge amount of negative noise. The line “stand for something, even if it means sacrificing everything” was in direct response to the NFL protests against police violence, and got some people so hot under the collar that the #boycottnike was trending in the days and weeks after the launch. However, that initial outcry doesn’t tell the whole story. In fact it seems quite the opposite: according to some data points, Nike’s sales have surged some 31% since the campaign. Truth indeed that standing for something is important in this age of cynicism and rock bottom corporate trust. 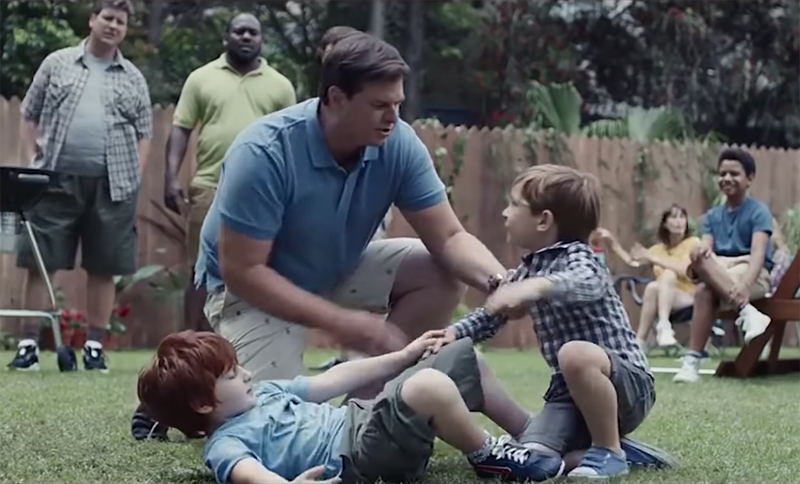 Whether Gillette continue the P&G trend of being early movers on a key issue, or a more cynical brand trying to lay claim to a very hot topic, remains to be seen. In fact, it will be determined by their actions in the coming weeks and months, for example: will they continue the debate or is this just a one off? Will they review their pink ‘Venus’ range for women (that includes names like Passion and Embrace and costs more than the men’s ranges)? We’ll have to see, but as Patagonia CEO Rose Marcario put it when discussing other companies embracing social issues, “the companies that do that in a way that’s really consistent with their values are rewarded for doing it”. If I were to hazard a guess, I would imagine this will not lead to the huge drop-off in market share that the #boycottgillette hashtag is currently predicting. Ultimately, they will be judged by this generation of consumers who, more so than ever, want to get behind organisations that stand for something. So, bravo then to Gillette, for the ambition to take on the subject. If this trend continues, 2019 could very well become the year of the brave brand. I certainly hope so. To keep moving in the right direction, a brand needs to be bigger than one person. This means you, CEOs. A visionary leader sounds like something to envy. Something that would be an asset to any company. And it’s easy to look at Tesla or Amazon and think they’re so successful because they had Elon Musk and Jeff Bezos and their competitors didn’t. As a story all about people, not economics and strategy, it makes a kind of instinctive sense. But a company’s vision shouldn’t live in one person. As part of the company brand, the vision belongs to everyone. The power of brand to engage and empower employees is too often overlooked. But the brand tells everyone what they’re here for and where they’re going. And when everyone knows that, everyone can help things keep moving in the right direction. Of course there are some upsides to having a charismatic figurehead attached to your company. They can put a human face on a corporation, making it easier for press and the public to engage. And as long as their star keeps rising, they’ll pull the company skyward in their wake. But when the founder or CEO becomes synonymous with the company, when the person becomes the brand, they also become a single point of failure. Elon Musk was the one who was going to make all our pulp sci-fi dreams come true, from travelling in tubes to colonising Mars. But what’s your impression of the man today? Isn’t he the one that gurned his way through a joint on that podcast? Didn’t Azealia Banks get trapped in his house somehow? And he sells flamethrowers now? Is he a science hero or a supervillain? Musk is the most recognisable element of the Tesla, SpaceX and Boring Company brands, so his erratic behaviour reflects on them all. And how must it feel for the staff? When the company’s reason for being is to execute one man’s vision, what does it mean for the company when that man’s focus starts to drift? That’s why brand can’t be dictated purely from the top. All areas of the company need to be involved in creating, maintaining and growing the brand. When everyone understands where the company is going, a detour by a single individual can’t derail the whole journey. A company, and its brand, is bigger than one person. The brand describes the company – and the company is all its people. We want to help define your brand in a way the whole company can get behind. With Blueleaf and the Payment Systems Regulator, we engaged the whole company to create brands that reflect and reinforce shared values and ambitions. A company’s vision shouldn’t live in one person. As part of the brand, the vision belongs to everyone. Your brand: it’s more than what you look like. It’s what you do. That’s why brand needs a seat in the C-suite. Case in point: this week The John Lewis Partnership launched a new visual identity with a powerful message – then immediately undermined that message with its actions. The company is owned by its employees, and that’s the point of difference that comes across loud and proud in its new logos, packaging, livery and TV ads. John Lewis and Waitrose have both added “& Partners” to their names and logomarks, and the new TV ad ends with the line, “If you’re part of it, you put your heart into it”. But 270 of those partners won’t be part of it for much longer. Back office staff in 50 shops recently found out they’re losing their jobs. The company’s actions don’t match its message. The message – the logomark, the feelgood ad – has been crafted with careful attention to brand. It doesn’t look like hiring/firing decisions are getting the same attention. The result: the value the company can get out of its new brand just dropped. Your brand is much more than a set of rules about colours, type and taglines. It’s everything that makes your organisation distinct. That makes it a powerful tool you can use to make meaningful connections and improvements for your business. As with many powerful tools, you’ll get the best results when your brand is wielded by an expert. But in our experience, companies don’t always make the most of their in-house brand experts, who work as design police most of the time and only get to flex their muscles when it’s time for a rebrand. Brand people are worth so much more: companies who base their behaviour on their brand, not just their look, grow twice as fast as others. We can only speculate about The John Lewis Partnership’s organisational structure, of course. But if there’d been a brand person in the room when the company decided to fire 270 partners, we imagine they’d at least have questioned the timing. And if that person had director-level power, maybe they could have challenged the decision itself – in the same way brand managers challenge stretched logos or incorrect typefaces. “This goes against our brand. We’re a partnership – that’s how our customers know we’re John Lewis and not some other retailer. Are we sure this is the right decision for us?” There will always be times when the bottom line has the final say – but brand should always factor into the decision. We want to help you make sure your messages and actions are aligned under a coherent brand. We’ve assessed and aligned mismatches between identity and behaviour for clients like the PSR, and the Government Office for Science. As with many powerful tools, you’ll get the best results when your brand is wielded by an expert. It’s a great time to be a challenger brand. First identified as a phenomenon by agency Eat Big Fish in the late 90s, challenger brands have since fallen a bit out of fashion. The headline-grabbing thing to be right now, supposedly, is a disruptor (more on them later). But headlines don’t always mean business success. And while disruptors are getting all the attention, conditions are right for challenger brands to thrive. So how can you tell if this means you? You’re a major player in your sector – but you’re not the market leader. You know your strengths and play to them – even if that means not pleasing everyone. Getting the right people to love you might make others hate you. Challenger brands embrace that specialism – and that recognition. Better to be hated by some than ignored by all. You succeed by outsmarting the competition – not by outspending them. You’re not big enough to throw your weight around, so instead you win by spotting the opportunities others miss. Better strategies for existing platforms. New ways to engage existing audience groups. Unoccupied space in the competitor landscape. Here’s where challenger brands differ from disruptors. Challenger brands learn the rules of their game inside out to find surprising new ways to get ahead. Disruptors aims to change the rules, or even change the game completely. That’s one reason it’s better to be a challenger brand than a disruptor right now. The potential rewards make disruption a tempting bandwagon, but a sector can only take so many disruptors trying to change the rules. Attempts at disruption either succeed, or leave the disruptor without a working business model. But a sector can see multiple challengers appear and still stay stable. The market leader might not be happy about all that competition, but the market can usually accommodate the new players. Finally, let’s face it: the economy isn’t at its best right now. And while that’s not great news overall, it does give the advantage to brands who are used to spending smart, rather than spending big. If you’re a challenger brand, you’re already used to doing more with less. If you’re a challenger brand – or you aspire to a challenger mindset – we want to help you make the most of this moment in time. We’ve done it for NEST, a challenger in the pensions sector, and the PSR, a rare industry regulator that’s also a challenger brand. Better to be hated by some than ignored by all. They are only used for anonymous tracking. No personal data is being recorded.